Education Perfect Teacher Certification represents the skill level of a teacher using Education Perfect, taking into account how experienced they are in using key features. Teacher Certification is recognised by the 1,000+ schools using Education Perfect around the world. Increasing your Teacher Certification Level can be useful in future career development as well as being a fantastic professional development opportunity to increase your ICT skills and get the most out of an Education Perfect subscription. You increase your Certification Level by earning Experience Points (XP). Many activities you complete in the Control Panel give you XP, such as logging into the Control Panel, creating tasks and content for your students, tracking their progress and more. When you earn a certain number of Experience Points, and have completed the core activities for the next level at least once, your Certification Level will increase! To encourage you to try all parts of Education Perfect, you receive double the Experience Points the first time you complete an activity. For example, the first time you create a Smart Lesson you will receive 40 XP instead of the standard 20. To achieve Level 1, log into the Control Panel and assign a Homework Task, Quick Test or Prebuilt Assessment to your students. The estimated time this will take to earn is around 10 minutes. This is the baseline target qualification for all teachers on our system and is held by the top 50% of teachers. To reach Level 2, you need to have earned 100 XP. You also need to have assigned an Assessment (either a Quick Test or a Prebuilt Assessment). Level 2 Certification is estimated to be earned over 6 months and it is held by the top 10% of teachers. To reach Level 3 you need to have earned 250 XP. You also need to have created one competition, and shared an example of best practice in the Teachers' Community. Level 3 Certification is estimated to be earned over 12-24 months and it is held by the top 5% of teachers. To reach Level 4 you need to have earned 1000 XP. You also need to have created a Smart Lesson or Custom Exam. Level 4 certification is estimated to be earned over 24-36 months and it is held by the top 1% of teachers. 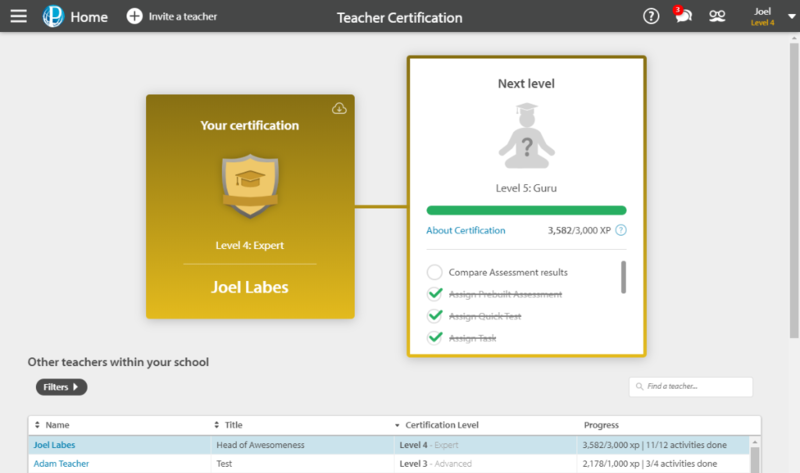 To view your current level of certification, and the progress that you are making towards the next level, select the button in the top right hand corner of the screen. You can see your current certification level in yellow underneath your name here. In the menu that appears, scroll down to and select Teacher Certification, and you will be taken to your personal Certification screen. Here you can find a breakdown of your current XP level and any specific things you need to do in order to gain the next level of teacher certification. Scroll down to see a list of your fellow teachers and their Certification Levels. You can download a badge to include in your email signature or on social media by clicking the download icon (cloud with an arrow) in the top-right of the Your certification tile.